NEVER UNDER-ESTIMATE GOD, EVEN IN CHINA. 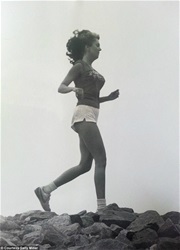 On that bright -but cold- September morning, in 1990, I was enjoying a short jog on a rare portion of restored Wall. Arthur was far behind me, struggling with extra bags and sleepiness. I craved privacy, especially in the early hours. I won’t deny that when Arthur lagged behind in the mornings, being alone felt nice. We had plenty of time in the evening to discuss the day’s activities; there was more than enough time for me to answer Arthur’s endless questions about America. Following the Wall’s sharp curve, I glanced over the edge and saw, from a distance of several city blocks, a group of black and white angora goats, grazing on a steep hillside. I easily recognized them as angora goats because I once loved an angora goat named Nannie. It was 1956 and I was leaving for school that particular morning when I spotted a fluffy white goat caught in oue neighbor’s broken wire fence. The sight of the poor little goat trying to chew his way out of his wire trap was heartbreaking and I had to get help. Lucky, my father was home. After freeing the beautiful animal, my father approached the goat’s owner about fixing his fence so more of his goats didn’t suffer the same fate. Learning who instigated the rescue, the neighbor decided to give me the goat as a present! I named my new pet, Nannie, and she lived in our backyard for years until she moved on-up to that big animal farm in Heaven. So many years later, I still love Nannie. I consider all goats as my pets---my babies. Directly above the Goats, the Great Wall hosted an elegant Watch Tower, so well-preserved it looked like an oriental home, complete with windows. It was straight ahead, meaning I’d be passing through that Watch Tower in about ten minutes. Reaching the multitude of steep steps that would carry me upward and inside the tower, I paused for a moment to catch my breath and, looking up, caught a quick glimpse of a slight figure wearing dark clothing. Almost hiding in the darkness, the figure was apparently the goats’ keeper. Running up the long, steep stairs, I rehearsed my Chinese greeting and wondering what gift I might offer my new friend. At last, reaching the top step, I hurried through the doorway and came face to face with a tiny, leather-faced Chinese man in a straw hat and clutching a wooden handle with a curved blade! Wow! With my mask-like smile frozen in-place, I began reciting my Chinese Greeting, repeating it several times…..yet the small Chinese just stood there, unmoved, grasping his sinister-looking weapon so…I decide to sing what little I knew of the very old, but famous, Great Wall Ballad. That did the trick! “The Goat man” dropped his curved knife, broke into a huge smile, and began jumping around the tower like an acrobat. Of course I couldn't understand his words but he was jabbering excitedly in Chinese. I realized my tiny friend must have been frightened, seeing a strange-looking person running toward him, so he’d grabbed his knife to protect himself. Since we were unable to communicate with words, I pulled out my Chinese peanuts and offered the small bag to him. He took the bag and began eating but, he seemed most-fascinated with my American Flag pin....he kept pointing to it and smiling. I’d faithfully worn my flag pin every day of my Great Wall Journey but now, it seemed time to pin it on my new friend in a gesture of peace. Finally able to catch up, Arthur was surprised to find me making friends with the Chinese man I referred to as the Goat Man. Finishing the peanuts, my new friend insisted on sharing his boiled water with Arthur and me and then, it was time to move on. One afternoon, almost six years later, after returning to China to teach, I received a phone call from my Chinese translator, Star Du. Star helped when I taught English to the hotel's staff and she wanted to visit me in my hotel room. A letter- written in Chinese- and addressed to me, had arrived from a far-away Chinese province and she needed to share it with me. Imagine my surprise when I learned the letter was from a young prisoner in Northeast China. Surprisingly, the prisoner had seen an older Chinese Magazine with my picture on the cover. Inside, the article told about my journey of The Great Wall and explained that I now taught English in Beijing. The prisoner had written me a letter and, not knowing where I lived, mailed it to the Magazine. Of course my letter passed through multiple hands before eventually finding me but….the prisoner’s story impressed everyone who read it. No one would have dared keep such an important letter from reaching its destination. The prisoner’s penmanship was impeccable. It seems, he had been beautifully educated for someone living in a small, remote village but daily life there was hard and…earning enough to keep his children from starving and his animals from dying, was almost impossible. When he was caught stealing bread from an outside vendor, he was given a sentence of life in prison. The young man had been in prison for more than three years when he saw the magazine with my photo. He remembered the countless times his father had told the story about meeting a tall white lady on The Great Wall, and each time, he showed them the flag pin she'd so graciously given him. Not too long after that, his father had suffered an illness and died. Most of all, the prisoner wanted me to know how honored his father had been to meet me that day on The Wall. And, the young man wondered if I had any photos of his father. I want everyone’s story to have a happy ending. Not only did I send the Goat Man's son the photos I had of his father and the two of us together, I also included photos of his father’s precious angora goats. Determined to help the young man, I received permission to visit the Chinese Government’s Director of Prisons to share the prisoner’s letter and also my story of meeting his father on The Great Wall. In the end, the Goat Man’s son was assigned to teach prisoners how to improve their writing skills. Not only did the young prisoner receive a small amount of money for teaching, but his lifetime prison sentence was reduced from life....to three years. 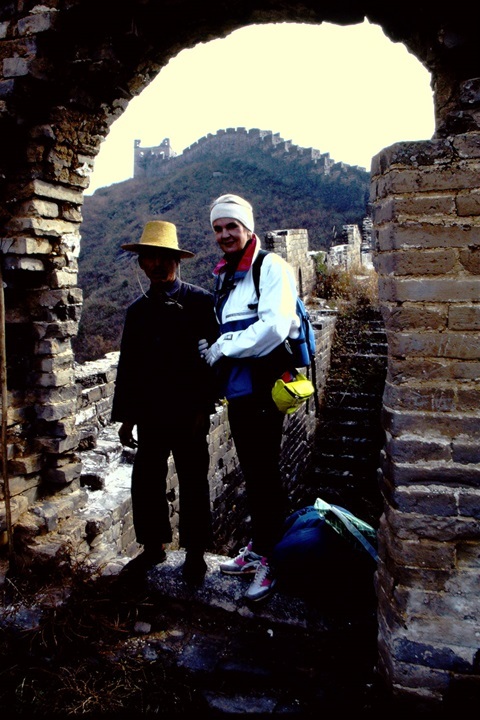 It was no coincidence that the Goat Man and I met on The Great Wall. It was no accident that the Goat Man’s son, a prisoner in a forgotten prison facility, far from Beijing, saw an old magazine with my photo and read my Great Wall story. Never doubt God. He works miracles every day, even in China.